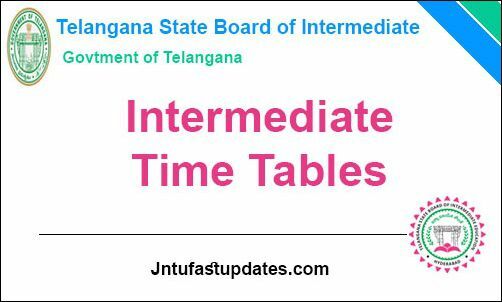 TS Intermediate 2nd Year Time Table 2019: TSBIE has announced the Inter Second Year Public Examination Time Tables 2019 today. Students can check their Telangana Inter 2nd Year Schedule March 2019 along with subject wise dates from below links and bie.telangana.gov.in. Manabadi TS Inter 2nd year Time table 2019 Download: Telangana State Board of Intermediate Education (TSBIE) is the Telangana State level education board to monitor the Intermediate education in the state. The department organizes the examinations, releases the results, monitors the quality of education and operates on many areas related to the Intermediate education. Every year TSBIE conducts the Intermediate examinations in the months of March-April and releases the results in the month of May. The time tables for the TS Intermediate examinations released in November/December months usually. Yearly, the student rate is remarkably raising in Telangana and also the pass rate is raising at a proportional rate. TS Inter Second year Time Table 2019: As per reports, the board is expected to release the date sheet for Intermediate 2nd Year examinations at a time. The sources say that last year the organization released the Telangana Intermediate Date sheet in the month of November. Hence this year also the TSBIE is expected to release the time table in the month of November last week or December earlier weeks. Hence the students undergoing the Intermediate education in the state of Telangana can get ready to download the final exam dates shortly. The date sheet will be released for Science, Arts, and Commerce courses for both years. TSBIE will announce the theory and practical exam time tables for the Intermediate students. Stay checking the TSBIE official website, bie.telangana.gov.in to check the updates regarding time table. All the students presently gaining the education in Telangana in the Intermediate 2nd year can check the end exam time table shortly. The date sheet is released in november. Candidates can download the TS Intermediate time table for theory and practical examinations. Soon after the time table is available, candidates can check the subject-wise exam dates and get ready for the examinations. To avoid the confusion of exam dates, clearly, go through the date sheet. It is hereby informed that on December the Teangana State Board of Intermediate Education has announced the Intermediate Public Examinations, March 2019 (Theory) schedule to be started from February, 2019. Andhra Pradesh Board of Intermediate Education also announced its IPE March 2019 (Theory) schedule starting from 28-02-2019. How to Download Telangana Inter 2nd Year Time Table 2019? Visit the TSBIE official wesbite, bie.telangana.gov.in and you will be navigated to the homepage, initially. Search for TS Intermediate 2nd Year Time Table 2019 for [Science/Maths/Arts] Download link on the homepage. The TS Inter Time tables 2019 will be downloaded on the screen. 1.2 How to Download Telangana Inter 2nd Year Time Table 2019?